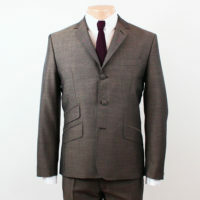 3 Ply Pure Wool and Mohair Tonic suit. Lovely cloth with a heavier feel than the regular tonics. All the usual JTG features including working cuffs twin vent ticket pocket and tapered slim fit flat front trousers. Mein englisch ist leider nich so besonders, daher schreib ich also in deutsch. Ein wirklich fantstischer Anzug und ein fantastischer Service. Nochmal vielen Dank. 3 ply Tonic is so lightweight. As with Jump the Gun trousers it is best to size up in the jacket as well, I went for a 48 reg as I’m between a 44/46 and it fits perfectly. You can always give Johnathan a call at the shop if you are unsure of sizing and he will offer expert advise. 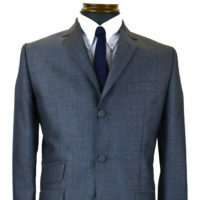 Next day delivery as well to top off a great shopping experience, with a nice suit protector/carrier thrown in!! This arrived today and I have to say I am very impressed. 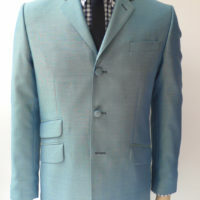 Nice mid blue, darker than the photograph, love the little touches, like the covered buttons. Excellent quality and fit. I sized up in the jacket and pleased I did. You have a customer for life although I got slightly nervous when it was held at JFK airport in customs for three weeks. 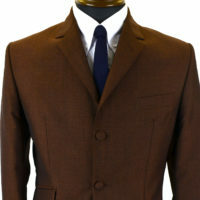 Will be ordering shirt, tie and accessories this week. Thanks Carl. Sorry about customs. All the best. Thanks Carl. Sorry about customs.